Fade up on a shot of Smith Jones dressed in a dark suit with a dark tie over a white button-down. His eyes are red from… not crying… Erm… He grabs a bottle of Visine and blinks the moisture into his eyeballs, wiping his cheeks and then staring off at nothing. A random thought flits through his mind and strikes him funny. He chuckles lightly to himself before finding a slightly darker thought to even his keel. Jones has a lot on his mind and he is about to share it with you. Smith takes a deep breath and he speaks. Legends was a crushing loss for me. I was absolutely committed to defeating Dom Harter and Angelica Vaughn (c) to become the First Ever Three-Time XWA World Television Champion!!! That didn’t happen. Instead, I lost the match under what I consider to be controversial circumstances. If you can’t see that I got robbed at XWA Legends, then you aren’t watching. Open your eyes. The camera zooms out to reveal that Jones is on his private jet flying from Miami to Toronto so that Smith can spend New Year’s Eve alone at his home on the outskirts of the city. He grunts and shakes his head a little. I told myself that if I didn’t win the World TV Title at Legends that I would walk away. Welp, I didn’t win… and even though I’m very unhappy with the way things ended in that career altering match, I feel compelled to stand by that. He looks directly into the camera lens. Jones picks up a frothy hot mug of white hot chocolate and holds it up. He raises his eyebrows and tilts his head forward with a slight twist. He takes a sip and then a long slurp of the white hot chocolate. He sets it down with a broadening smile. To the XWA roster... to the office... and of course to the true blue XWA fanbase... I wish you the best of luck in your future endeavours. This locker room is chock full of creative and violent superstars who will keep the XWA alive and kicking for many years to come. 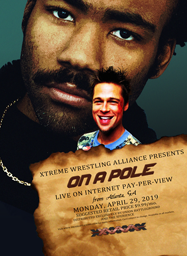 I have done everything that I felt the need to do in the XWA. There is a handful of you with whom I would still very much enjoy to get into the ring with. I am sorry that Vee and I won’t be having our match. I will miss the opportunity to crack Austin Carter’s skull open like a rotten egg on a rusty skillet. I’ve never had the honour of working with Lx-Tim. That could very well happen down the road. So many more names I could be mentioning, but I want to keep this brief. For now, I feel the need to pay full attention to what I am about to do in 4 Corners Wrestling. I’ve been offered a very lucrative contract. That contract helped me buy and refurbish this military cargo plane into a flying palace wherein I can transport my white limo anywhere in the world! This is the beginning of a new chapter for Smith Jones. You’re not going to want to miss it! I hold no ill will towards anyone in the XWA. I’m leaving a massive hole in my wake. Dare you to fill it in my absence. I dare you all! Best of luck with that. Smith Jones is not your problem anymore. Never forget the words I’ve spoken far too many times before. You people must be so tired of hearing it. The video flashes white and cuts to black.